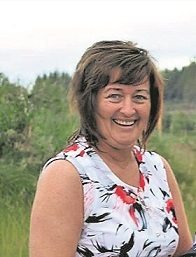 The Parish of Inver was stunned by the recent untimely death of one of it's most respected and loved residents, the late Bridie Kelly, nee Devlin, of Drimbigh, Mountcharles on the 30th of April at the age of just 54. Known throughout the area for her cheery nature ans almost permanent smile, Bridie was an extremely hard worker who was always on the go and gave a hundred and ten per cent everywhere she worked. She loved helping people and always put other people before herself. Her family recall that she seldom had time to watch television with the one exception of The Rose of Tralee! She was born on December 21st, 1963 to Kitty and Mick Devlin in Drimbigh Mountcharles. (Her husband John used joke that this, being born on the shortest day, was the reason for her short stature!) She attended St Peter's National School in Mountcharles and was a member of the school band, playing the tin whistle. Bridie spent all her working life in local employment, working in Peggy Cleary's B+B; in Magee's as a machinist; in Victor Company for Patrick Breslin also as a machinist; as a cleaner in St Peter's school; and most recently since 2013 in the Bluestack Centre in Drimarone where her high point was her excitement at appearing with Francis Brennan on "At Your Service" on RTE TV. She was also an extremely popular baby sitter because of her kind nature and she looked after many children in the locality. She married John Kelly on August 29th, 1987 and they celebrated their 30th anniversary last year. They have three children of whom she was very proud; Donna, Karen and Shaun. She was especially proud of all the awards Shaun picked up for short films as an extremely talented animator. Bingo was one of her great passtimes and she was very lucky with many wins. She also loved country dancing and was a great jiver ans was also very talented at sewing. May was her favourite month when she always tried to get away to the sun in Tenerife with John. The birth of her grandchild, Conor, to Donna and Des McGroarty this year gave her immense joy. Indeed she had great love of all her extended family and friends and especially her little niece Katie, who was always by her side. GAA also featured in her life and her first allegiance was to ladies football where she always turned out to support Donna and Karen when they played for St Nauls. Her first visit to Clones was to cheer on her Godson, Gavin Mulreany when he played in goals for Donegal when they won the Ulster Final in 2016. Bridie had four siblings, Mary, Michael, Harry, deceased and Martin also deceased. The huge wake and funeral was testament to the very high regard in which she was held in the Parish. Her childhood friend and neighbour, Fr Patsy McDermott paid a touching tribute to her at the conclusion of Mass which was celebrated by Fr Francis Ferry assisted by Fr Seamus Gallagher P.P. and Fr Patsy who also married them (his first marriage ceremony). Refreshments were served at her workplace in The Bluestack Centre in Drimarone which wasn't an easy task for Rosemary and all her staff, of which Bridie was a beloved colleague.